"Cook County" redirects here. For other uses, see Cook County (disambiguation). Cook County is a county in the U.S. state of Illinois. It is the second-most populous county in the United States after Los Angeles County, California. As of 2017, the population was 5,211,263. Its county seat is Chicago, the largest city in Illinois and the third-most populous city in the United States. More than 40% of all residents of Illinois live in Cook County. 2nd largest county in U.S.
That part of the county which lies outside the Chicago city limits is divided into 29 townships; these often divide or share governmental services with local municipalities. Geographically, the county is the sixth-largest in Illinois by land area. It shares the state's Lake Michigan shoreline with Lake County. Including its lake area, the county has a total area of 1,635 square miles (4,234.6 km2), the largest county in Illinois, of which 945 square miles (2,447.5 km2) is land and 690 square miles (1,787.1 km2) (42.16%) is water. Land-use in Cook County is mainly urban and densely populated. Cook County was created on January 15, 1831, out of Putnam County by an act of the Illinois General Assembly. It was the 54th county established in Illinois and was named after Daniel Cook, one of the earliest and youngest statesmen in Illinois history. He served as the second U.S. Representative from Illinois and the state's first Attorney General. In 1839, DuPage County was carved out of Cook County. Cook County was reduced to its current size in 1839 by the creation of DuPage County. The government of Cook County is primarily composed of the Board of Commissioners, other elected officials such as the Sheriff, State's Attorney, Treasurer, Board of Review, Clerk, Assessor, Recorder, Circuit Court judges, and Circuit Court Clerk, as well as numerous other officers and entities. Cook County is the only home rule county in Illinois. The Cook County Code is the codification of Cook County's local ordinances. Cook County's current County Board president is Toni Preckwinkle. The Circuit Court of Cook County, which is an Illinois state court of general jurisdiction is funded, in part, by Cook County, and accepts more than 1.2 million cases each year for filing. The Cook County Department of Corrections, also known as the Cook County Jail, is the largest single-site jail in the nation. The Cook County Juvenile Detention Center, under the authority of the Chief Judge of the court, is the first juvenile center in the nation and one of the largest in the nation. The Cook County Law Library is the second-largest county law library in the nation. In the 1980s, Cook County was ground zero to an extensive FBI investigation called Operation Greylord. Ninety-two officials were indicted, including 17 judges, 48 lawyers, 8 policemen, 10 deputy sheriffs, 8 court officials, and a state legislator. The Bureau of Health Services administers the county's public health services and is the third-largest public health system in the nation. Three hospitals are part of this system: John H. Stroger, Jr. Hospital of Cook County, Provident Hospital, and Oak Forest Hospital of Cook County, along with over 30 clinics. The Cook County Department of Transportation is responsible for the design and maintenance of roadways in the county. These thoroughfares are composed mostly of major and minor arterials, with a few local roads. Although the County Department of Transportation was instrumental in designing many of the expressways in the county, today they are under the jurisdiction of the state. The Cook County Forest Preserves, organized in 1915, is a separate, independent taxing body, but the Cook County Board of Commissioners also acts as its Board of Commissioners. The district is a belt of 69,000 acres (280 km2) of forest reservations surrounding the city of Chicago. The Brookfield Zoo (managed by the Chicago Zoological Society) and the Chicago Botanic Garden (managed by the Chicago Horticultural Society) are located in the forest preserves. Cook County is the fifth-largest employer in Chicago. In March 2008, the County Board increased the sales tax by one percent to 1.75 percent. This followed a quarter-cent increase in mass transit taxes. In Chicago, the rate increased to 10.25 percent, the steepest nominal rate of any major metropolitan area in America. In Evanston, sales tax reached 10 percent and Oak Lawn residents pay 9.5 percent. On July 22, 2008, the Cook County board voted against Cook County Commissioner's proposal to repeal the tax increase. In 2016, Cook County joined Chicago in adopting a $13 hourly minimum wage. Cook County Board chairman John Daley called the wage hike "the moral and right thing to do." In June 2017, however, nearly 75 home rule municipalities passed measures opting themselves out of the increase. The county has more Democratic Party members than any other Illinois county and it is one of the most Democratic counties in the United States. Since 1932, the majority of its voters have only supported a Republican candidate in a Presidential election three times, all during national Republican landslides–Dwight Eisenhower over native son Adlai Stevenson II in 1952 and 1956, and Richard Nixon over George McGovern in 1972. Since then, the closest a Republican has come to carrying the county was in 1984, when Ronald Reagan won 48.4 percent of the county's vote. The 1970 Illinois Constitution allows the party controlling the state legislature to redraw voting districts. The Democrats won complete control of state government in 2003; since then redistricting combined with demographic changes resulted in the party winning additional seats in the U.S. House of Representatives from Republicans in 2012. Analysts say the redistricting better represented the demographics of the state. Republicans are well established in certain districts, where they elect Republican candidates of their choice. The Cook County Democratic Party represents Democratic voters in 50 wards in the city of Chicago and 30 suburban townships of Cook County. 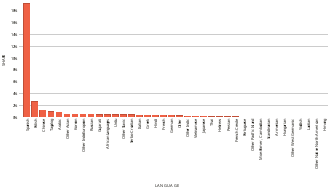 The organization has dominated County, city, and state politics since the 1930s. The last Republican mayor of Chicago was William Hale "Big Bill" Thompson, who left office in 1931 with a record of corruption. The high-water mark for Republican candidacies for mayor since then was that of Republican candidate Bernard Epton, who in 1983 came within 3.3 percentage points of defeating Democrat Harold Washington. To establish more localized government control and policies which reflect the often different values and needs of large suburban sections of the sprawling county, several secession movements have been made over the years which called for certain townships or municipalities to form their own independent counties. In the late 1970s, a movement started which proposed a separation of six northwest suburban townships, Cook County's panhandle (Barrington, Hanover, Palatine, Wheeling, Schaumburg, and Elk Grove) from Cook to form Lincoln County, in honor of the former U.S. president and Illinois resident. It is likely that Arlington Heights would have been the county seat. This northwest suburban region of Cook was at the time moderately conservative and has a population over 500,000. Local legislators, led by State Senator Dave Regnar, went so far as to propose it as official legislation in the Illinois House. The legislation died, however, before coming to a vote. In 2004, Blue Island Mayor Donald E. Peloquin organized a coalition of fifty-five south and southwest suburban municipalities to form a new county, also proposing the name Lincoln County. The county would include everything south of Burbank, stretching as far west as Orland Park, as far east as Calumet City, and as far south as Matteson, covering an expansive area with a population of over one million residents. Peloquin argued that the south suburbs are often shunned by the city (although Chicago is not bound or required to do anything for other municipalities) and he blamed the Chicago-centric policies of Cook County for failing to jumpstart the somewhat-depressed south suburban local economy. Pending sufficient interest from local communities, Peloquin planned a petition drive to place a question regarding the secession on the general election ballot, but the idea was not met with success. Talk of secession from Cook County amongst some outlying communities again heated up in mid-2008 in response to a highly controversial 1% sales tax hike which has pushed the tax rates across the county communities up amongst the highest in the nation. Some border towns in particular had been outraged, as people can take their business across the county border (paying, for instance, 7% in Lake County instead of Palatine's 9.5%). The secession issue eventually died down from the nominal tax increase. In 2011, two downstate Republican state representatives, Bill Mitchell of the 87th district and Adam Brown of the 101st district, proposed statehood for Cook County. Mitchell said that Chicago is "dictating its views" to the rest of the state and Brown added that Chicago "overshadows" the rest of Illinois. According to the U.S. Census Bureau, the county has a total area of 1,635 square miles (4,230 km2), of which 945 square miles (2,450 km2) is land and 690 square miles (1,800 km2) (42.2%) is water. It is the sixth largest county in Illinois by land area, and the largest in total area. Most of the water is in Lake Michigan. The highest point is more than 950 feet (290 m), and is in northwest Barrington Township, in the northwest corner of the county. The lowest point is less than 580 feet (180 m), along the Lake Michigan shoreline. In July, temperatures in Chicago, Cook County average daytime highs of 84 °F (29 °C), and nighttime lows of 68 °F (20 °C); and January daytime highs of 31 °F (−1 °C), and nighttime lows of 18 °F (−8 °C). Winter temperatures will sometimes veer above 40 °F (4 °C), and, although not common, have also risen over 50 °F (10 °C) on some winter days. Average monthly precipitation ranged from 4.30 inches (109 mm) in June to 1.77 inches (45 mm) in February. Cook County is among the few counties in the United States to border two counties with the same name (Lake County, Illinois and Lake County, Indiana). Illinois has two such counties (Randolph County borders both Perry County, Illinois and Perry County, Missouri). As of the 2000 Census, there were 5,376,741 people, 1,974,181 households, and 1,269,398 families residing in the county. The population density was 5,686 people per square mile (2,195/km²). There were 2,096,121 housing units at an average density of 2,216 per square mile (856/km²). The racial makeup of the county was 56.27% white, 26.14% Black or African American, 0.29% Native American, 4.84% Asian, 0.05% Pacific Islanders, 9.88% from other races, and 2.53% from two or more races. 19.93% of the population were Hispanic or Latino of any race. 9.1% were of Polish, 8.1% German, 7.9% Irish and 5.7% Italian ancestry. 17.63% reported speaking Spanish at home; 3.13% speak Polish. Whites (Hispanic and non-Hispanic) number roughly 2,793,500. There are about 2,372,500 non-Hispanic whites residing in Cook County. Sizeable non-Hispanic white populations are those of German (11.4%), Irish (10.3%), Polish (9.7%), Italian (6.1%), and British (4.1%) descent. There are also significant groups of Swedish (1.5%), Russian (1.5%), French (1.3%), Greek (1.2%), Czech (1.0%), Dutch (1.0%), Lithuanian (0.9%), and Norwegian (0.8%) descent. Black Americans are the second largest racial group. Black Americans form over one-quarter (25.4%) of Cook County's population. Blacks of non-Hispanic origin form 25.2% of the population; black Hispanics make up the remaining 0.2% of the populace. There are roughly 1,341,000 African Americans of both Hispanic and non-Hispanic origin living in Cook County; 1,328,000 are non-Hispanic blacks. Roughly 52,500 people were of Sub-Saharan African ancestry, making up 1.0% of the total population. The Native American population is sizeable but small proportionally. Over 10,200 residents of Cook County are of Native American ancestry, equivalent to just 0.2% of the total population. There are 974 Cherokee, 612 Chippewa, 430 Navajo, and 96 Sioux living in Cook County. Native Americans of Hispanic origin represent much of the Native American population group. Some 5,900 Native Americans are of non-Hispanic origin, so some 4,300 are of Hispanic origin. Over 40% of the Native American racial group is of Hispanic descent. Asian Americans are a sizeable racial group in the county, numbering over 300,800. The Asian population is ethnically diverse, and includes roughly 87,900 Indians, 61,700 Filipinos, 60,700 Chinese, 35,000 Koreans, 13,700 Vietnamese, and 11,100 Japanese. Roughly 30,800 are of other Asian ethnic groups, such as Thai, Cambodian, and Hmong. Indian Americans make up 1.7% of the population, while Chinese and Filipino Americans make up 1.2% of the population each. Pacific Islander Americans form the smallest racial group in Cook County. Just over 3,000 are of Pacific Islander heritage. This group includes roughly 780 Native Hawaiians, 670 Guamanians, 120 Samoans, and 1,400 people of other Pacific Islander groups. Hispanic and Latino Americans make up over one-fifth (22.8%) of Cook County's population. Roughly 1,204,000 Hispanics live in the county. Mexicans are, by far, the most common Hispanic group. Cook County's 925,000 Mexican Americans make up 17.5% of its population. Roughly 127,000 Puerto Ricans make up 2.4% of the population. About 12,200 Cubans form 0.2% of the total population. There are some 140,000 Hispanics and Latinos of other nationalities living in Cook County (i.e. Colombian, Bolivian, etc., and they collectively make up 2.6% of the county's population. According to the 2000 Census there were 1,974,181 households out of which 30.9% had children under the age of 18 living with them, 44.0% were married couples living together, 15.6% had a female householder with no husband present, and 35.7% were non-families. 29.4% of all households were someone living alone including 9.3% who were 65 years of age or older. The average household size was 2.68 and the average family size was 3.38. 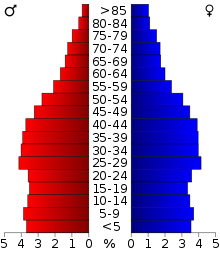 In the county, the population age distribution was: 26.0% under the age of 18, 9.9% from 18 to 24, 31.7% from 25 to 44, 20.7% from 45 to 64, and 11.7% who were 65 years of age or older. The median age was 34 years. For every 100 females, there were 93.9 males. For every 100 females age 18 and over, there were 90.5 males. The median income for a household in the county was $45,922, and the median income for a family was $53,784. Males had a median income of $40,690 versus $31,298 for females. The per capita income for the county was $23,227. About 10.6% of families and 13.5% of the population were below the poverty line, including 18.9% of those under age 18 and 10.3% of those age 65 or over. According to Census Bureau estimates, the county's population was down to 5,211,263 in 2017, decreased further by 2010 (5,194,675) and had grown slightly by 2017 (5,211,263). 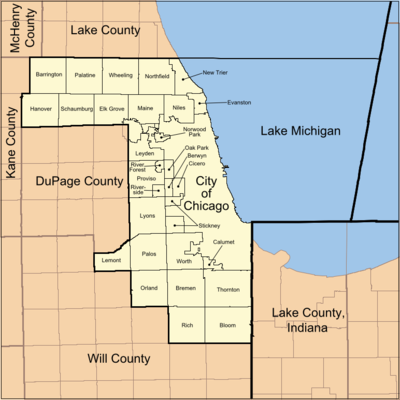 The county is divided into 29 townships, in addition to the cities of Chicago and Evanston. Chicago's eight former townships and annexed parts of others no longer have any governmental structure or responsibility since their annexations, but their names and boundaries are still used on property plats and by Cook County for tax assessment purposes. In 2014, Evanston Township was dissolved by voters and its functions were absorbed by the city of Evanston. ^ a b Streamwood Quadrangle – Illinois – Cook Co (Map). 1:24,000. 7.5-Minute Series (Topographic). United States Geological Survey. 2013. ^ a b Chicago Loop Quadrangle – Illinois – Cook Co (Map). 1:24,000. 7.5-Minute Series (Topographic). United States Geological Survey. 2013. ^ U.S. Census Bureau. American Community Survey, Profile of General Population and Housing Characteristics 2010, Table DP-1, 2010 Demographic Profile Data. American FactFinder Archived September 11, 2013, at the Wayback Machine. Retrieved June 22, 2014. ^ "County Population Estimates". Retrieved April 4, 2014. ^ Gove, Samuel Kimball (1996). Illinois Politics and Government: The Expanding Metropolitan Frontier. Politics and Governments of the American States. University of Nebraska Press. p. 156. ISBN 0-8032-7014-3. LCCN 95046017. Retrieved April 4, 2014. ^ "Circuit Court of Cook County an Informational Guide" (PDF). 2008. Archived from the original (PDF) on March 1, 2007. Retrieved December 16, 2008. ^ "All the extra cost will be no small change". Chicago Tribune. 2008. Retrieved March 2, 2008. ^ "Chicago's Largest Employers". ChicagoBusiness. ^ "Cook County Board 'rejects' sales tax increase repeal". Chicago Tribune. July 22, 2008. Retrieved July 23, 2008. ^ Elejalde-Ruiz, Alexia. "Cook County approves $13 hourly minimum wage affecting suburbs". Chicago Tribune. Retrieved December 6, 2016. ^ Slowik, Ted (June 28, 2017). "Slowik: Towns are right to opt out of Cook County minimum wage law". Daily Southtown. Retrieved June 30, 2017. ^ Howley, Kerry (November 6, 2012). "Tammy Duckworth Wins in Illinois, as Does Gerrymandering and Deadbeat-Dad Shaming". Slate. Retrieved November 11, 2012. ^ Bazelon, Emily (November 9, 2012). "It's Appalling that Gerrymandering Is Legal". Slate. Retrieved November 11, 2012. ^ Greenbaum, Mark (June 8, 2011). "Democrats' revenge in 2012: a radical Illinois gerrymander". Christian Science Monitor. Retrieved November 11, 2012. ^ See, e.g., Cook County Board of Commissioners. ^ "Bernard E. Epton Is Dead at 66; Ran for Mayor of Chicago in '83". The New York Times. December 14, 1987. Retrieved February 11, 2014. ^ Cleveland, Charles (September 1977). "Carving another county out of Cook". Illinois Issues. Archived from the original on September 8, 2006. ^ "Blue Island mayor wants to create "Lincoln County"". WLS-TV News (abc7chicago.com). June 25, 2004. Archived from the original on June 29, 2011. ^ PinPoint Sales Tax Lookup. Zip2tax.com. Retrieved on 2013-07-21. ^ "2 GOP legislators propose separating Cook County from Illinois". SJ-R.com. November 22, 2011. Cf. Winston County, Alabama. ^ "Population, Housing Units, Area, and Density: 2010 – County". United States Census Bureau. Retrieved July 11, 2015. ^ a b "Monthly Averages for Chicago, Illinois". The Weather Channel. Retrieved January 27, 2011. ^ "State & County QuickFacts". United States Census Bureau. Retrieved January 20, 2016. ^ "Language Map Data Center". www.mla.org. ^ "accessed May 17, 2011". Factfinder2.census.gov. October 5, 2010. Retrieved April 4, 2014. ^ Matthew Dietrich (September 19, 2014). "Evanston Township ceases to exist". Huffington Post. Retrieved November 17, 2016. Wikimedia Commons has media related to Cook County, Illinois.